SONC offers four types of volleyball competition: individual skills, traditional, Unified and modified team. Individual skills competition allows Special Olympics athletes to develop sports skills in a competitive format designed to serve as a stepping stone to team competition. The indvidual skills offered for volleyball are overhead passing, serving, and passing. Traditional volleyball team competition is played on a regulation volleyball court with a traditional indoor leather volleyball. Modified volleyball team competition is played on a regulation volleyball court but a lighter, larger volleyball. The service line is also moved closer to the net. Unified Volleyball team competition is played on a regulation volleyball court bringing together people with intellectual disabilities (athletes) and people without intellectual disabilities (partners) on the same teams. Additional competition opportunities will be available for Unified Sports. This is being done in anticipation of potentially removing all Unified competition from state-level events starting in the 2019-2020 program year. Athletes and partners also have the opportunity and are encouraged to participate in various local invitationals. Check the volleyball sport calendar for upcoming invitationals being hosted by local programs. If you are interested in hosting an invitation please contact the sports department at sports@sonc.net. The Appalachian State University women’s volleyball team will host a volleyball clinic on Sunday, April 7, 2019! This clinic will be held at the Varsity Gym on the ASU campus from 1-3pm. Registration is currently open and will close on Tuesday, April 2nd. Special Olympics Cumberland County will be hosting a volleyball invitational on Saturday, May 19th at Cape Fear High School, 4762 Clinton Road, Hope Mills, NC. Competition will consist of modified, traditional and Unified team play. This invitational will provide experience in a game-like setting among a variety of teams with similar skills and abilities. Lunch will be provided to registered atheletes and coaches. There is no registration fee and space is limited. Registration is due to Jeremy Mincey by Friday, April 26, 2019. About Volleyball: The game of volleyball is attractive to all types of players, from competitive to recreational, young and old. To play volleyball players need to acquire a few basic skills, learn a few rules, require very little equipment, and can play the game almost anywhere – from the beach to the gym. 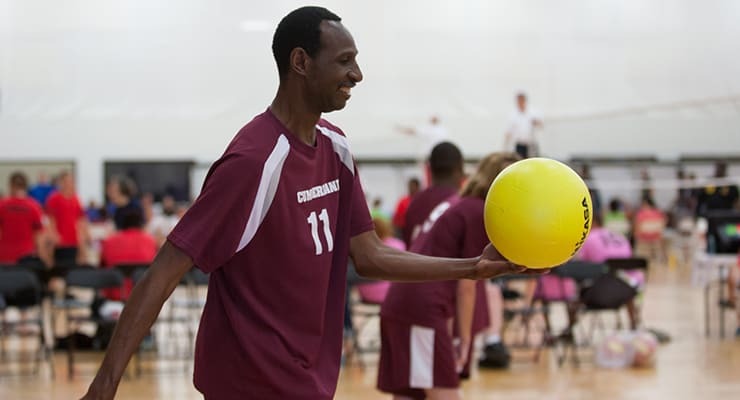 Differences of Special Olympics Volleyball: Special Olympics North Carolina offers 4 variations of volleyball: Standard Indoor, Modified Indoor, Unified Indoor, and Skills Competition. Competitions follow FIVB rules with minor modifications which include changes to court size, net height, and volleyball weight and size. Additionally, once a server has scored three consecutive points, his/her team shall rotate to the next server and continue to serve. History: Volleyball made its first appearance at a state-level competition in 1975, but was not officially added to the Summer Games line-up until 1991. The Robeson County women’s volleyball team won a bronze medal in competition at the 1991 International Summer Games. The Wake County unified volleyball team won a bronze medal in competition at the 1991 International Summer Games. Buncombe County became the first Special Olympics North Carolina program to send a volleyball team to the International Summer Games in Baton Rouge, LA in 1983 and won a silver medal.